At South Shore Paving, we have spent almost a decade as the premier paving contractor serving Woodbridge. With many more years of combined experience, our team is well prepared to help you with any of your asphalt paving or concrete needs. We recently received an online quote request for parking lot installation in Woodbridge. The client who contacted us was the property manager of a local organization. They were looking to expand their parking lot. The client explained to us that it had been many years since the parking lot had any form or parking lot repair or asphalt maintenance. There were a number of potholes and severe cracking throughout. We assured the client that we would be able to handle the job. We set a date to visit the parking lot site to perform an examination. This allows us to provide a detailed estimate of costs, time, and schedule. Our crew arrived on scene to perform the evaluation. It was clear that some significant parking lot reconstruction was necessary. We decided to perform a remove and replace reconstruction. When this occurs, we remove asphalt and other material. Then we install a new base layer and asphalt on top. This gives the parking lot a brand new feel and revitalizes the asphalt surface. With a new surface, the parking lot regained its structural capacity and functionality. The customer was extremely happy. After speaking further with the customer, we laid our a solid asphalt maintenance plan. With proper asphalt maintenance, it is easy to avoid costly asphalt repair work. At South Shore Paving we make customer satisfaction our priority. 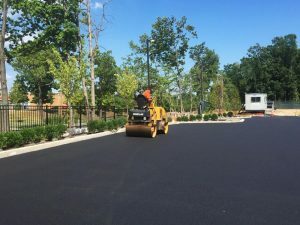 Whether you are looking for pothole patching, or new parking lot installation, South Shore Paving is the asphalt company you can trust. Give us a call today! We are ready to help with your next asphalt or concrete project!